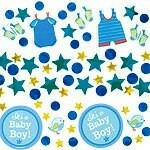 Shower party guests with our 'Baby Boy Clothes Line' Baby Shower Confetti, featuring three cute baby shower designs: round cutouts, baby clothes cutouts, and blue foil stars. With complementary dots and lots of tiny stars, this baby shower confetti adds a starry touch to invitations, favour bags, and party décor! Shower party guests with our 'Baby Boy Clothes Line' Baby Shower Confetti, featuring three cute baby shower designs: round cutouts, baby clothes cutouts, and blue foil stars. With complementary dots and lots of tiny stars, this baby shower confetti adds a starry touch to invitations, favour bags, and party décor! Confetti product details: 34g net weight 3 Designs Cardboard and foil construction.